A 44-year-old woman survived a python attack in Lephalale, Limpopo. A 44-year-old woman survived a python attack in Lephalale, Limpopo, Beeld reported on Tuesday. 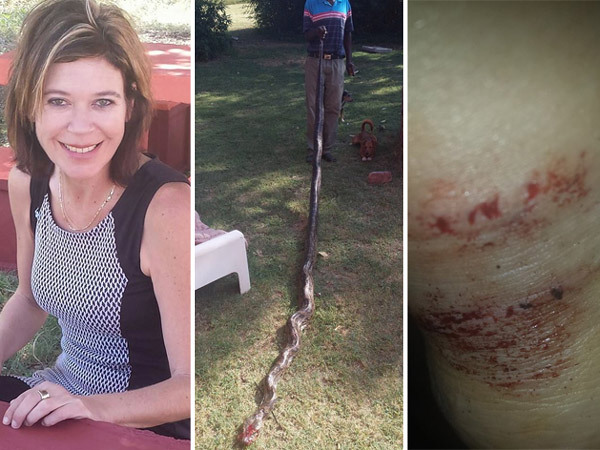 Janet Prinsloo thought she was going to die on Saturday morning when the four-meter long snake sailed out from under her bed and started squeezing her. According to the report, Prinsloo got out of the shower and got dressed when she felt something around her ankle, when she looked down she saw the snake's head. The snake started turning itself tighter around her leg. "The snake had a big head and teeth and I realised I had to get him off me," Prinsloo was quoted as saying. Beeld reported that she tried to get the snake off her leg using both her hands but the snake was very strong. "There was blood everywhere because the snake was biting me." Prinsloo said after a struggle she was on the floor to get the snake off her and she realised she needed to get away from the snake and she put a pillow in between her and the python. Her nine-year-old son Jakobus Botha jumped through an open bedroom window and ran to where Prinsloo's fiancé Brent Birk was. Birk tied a shoelace around Prinsloo's leg and took her to hospital 50km away. "I got five injections... Brent raced back and killed the snake," said Prinsloo.